Does your cat like to climb on things that they shouldn’t? So what’s the solution? A cat tower of course. Cat towers are a safe place for kitties to climb, scratch, sleep, and jump on. How do you go about finding the best cat towers for sale? Well, there are few characteristics that you should take into consideration. Check out these common features. Perches: Perches are important. Cats can be picky and they might not like to perch down low to the ground, especially if there are big scary dogs in the home. Cat perches can have one, two, three or more perches for your feline friend. Scratching Post: Does your kitty like to scratch...everything? If so, consider a tower with a scratching post on it. This can stop your kitty from scratching things that they shouldn’t be scratching, such as your furniture. Color: The color may not be important to your cat, but it could be important to you and your decor. Do you want the cat tower to match your carpeting? Maybe your walls? These products can come in a wide variety of colors. Houses: Do you have multiple cats that don’t like to share? This is where the number of cat houses can come in handy. If you have two very independent cats, then you are going to want more than one house. Size: When choosing your cat tower, consider the size. You aren’t going to want it to take up most of your living room, are you? Not to mention, you probably won’t need a huge tower for a tiny cat or if you’re in a small apartment. Material: The material that your cat tower is made from is something that you should really consider because it could be the difference between flimsy and solid. If your cat is a little overweight, consider a harder material. Alright, folks, let’s get down to business. This list compiles some of the best cat tower reviews all into one cat tower buying guide. If you are in a hurry and just want a quick fix for your cat to stop sleeping on your clean laundry, then check out our budget pick. This is the most affordable option with a great value attached to it. If you’re ready to check out the whole list, then keep reading. The Armarkat Cat Condo is our top pick starting off the list. 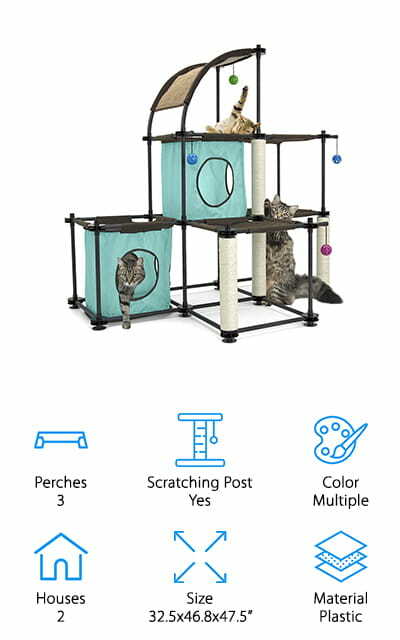 If you have a kitty that loves to claw everything in sight, you will be pleased to know that your feline friend can claw on the posts of this cat condo all they want. The board material is made of pressed wood and is covered in faux fur for their comfort. This particular cat condo measures 20x28x65 inches and can hold up to 50 pounds of cat. They will have five perches to choose from as well as one house and a pretty cook hammock for them to lounge in. There is also one house that your cat can sleep in without being disturbed and a built-in back scratcher for them to go through. You can get this condo in a variety of colors. There’s no doubt that this is one of the top rated cat towers on the market and at a price that you can afford. Our budget pick is the Kitty City Cat Condo. This particular cat housing product is ideal for multiple cats and can attach itself to other Kitty City modular products to make even bigger condos for your spoiled cat. You can also personalize your cat’s furniture based on their individual preferences as well. It is easy to assemble and easy to clean as well as move around due to its lightweight nature. 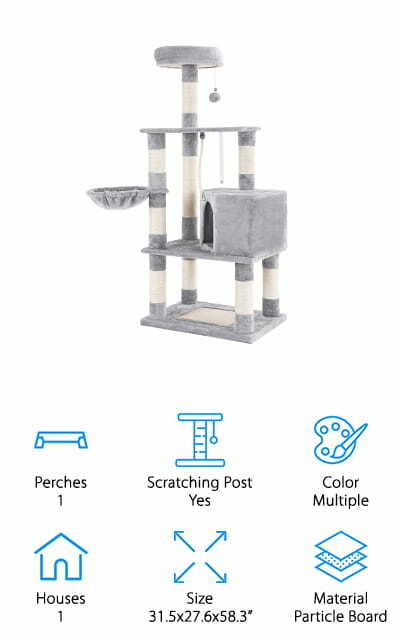 There are multiple scratching posts for your cats enjoyment, multiple houses, many perches, and it even comes with some toys that they can play with. 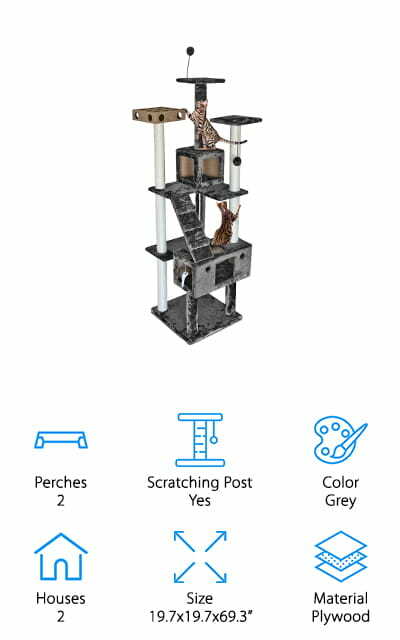 This is one of the best cheap cat towers that you can find that has all of these features for your cat. It encourages an active lifestyle for your kitty without completely taking over your living room or bedroom. There are different options that you can choose from for the style and color to make it more fun for you and your cat. It’s not the biggest cat tower out there, but it does the job if your only have one cat and they don’t care about material objects. The TRIXIE Pet Baza Cat Tree features two scratching posts wrapped with natural sisal. These scratching poses save your furniture or carpet from the dreaded claws that seem to destroy everything. On the one, there is a dangling pom pom toy for their amusement. They can spend hours batting it around and then when they are done they can climb up into the hammock and take a cat nap. The hammock is supported with a metal rim to add support for your not so skinny kitty. The rest of the tree is wrapped in soft long-haired plush fabric that is comfortable enough for even the pickiest of cats. This cat tree isn’t overly huge, only coming in at about 10 pounds and measuring 16x16x20 inches, so it may fit wonderfully in any small room. 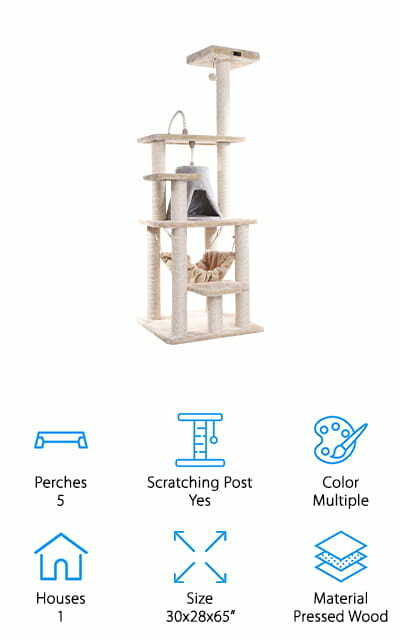 The Go Pet Club Cat Tree is one of those cool cat towers that you will love to have in your home. It comes in a beige color and features all natural sisal rope to keep their busy claws occupied while your furniture and carpet remain free from scratches. 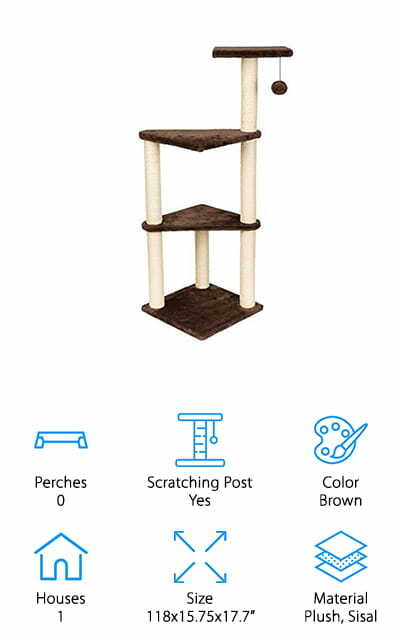 This tower is great for a medium sized cat and features two perches that they can enjoy. On the second level, there is a cute little house that a ladder takes them to, not that they’ll probably ever use it because they’re cats and they would rather jump. There are two perches that with a toy attached to each one to keep them busy as well. This cat tower is made from compressed wood and plush fabric for their comfort. It measures 21x21x52 inches and you can buy them in packs of one, two, or three or four. Tools for assembly are included and you can have it built in no time. 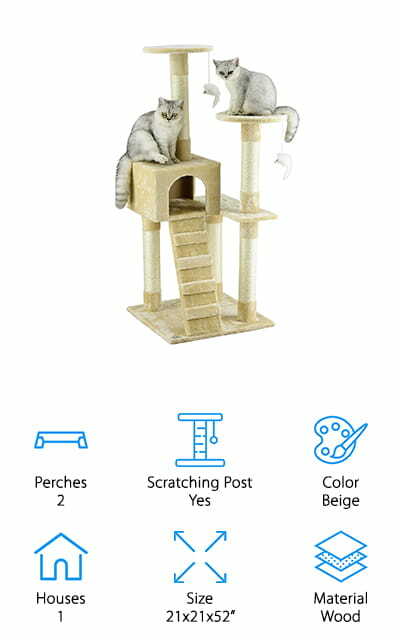 Your cat is going to go crazy with one of these amazing cat towers for them to climb on and scratch to bits. The Furhaven Pet Cat Tree House features two separate cat condos that are enclosed for their privacy because we all know they are about privacy. The condo on the second level can be reached with a ladder that your cat may or may not use. At the top of the tower is a fancy Cat-IQ busy box that features two jingly balls for them to bat around. This multi-level tower is ideal for exercise jumping, stretching, scratching, and playing. There are multiple natural sisal rope scratching posts to keep your cats’ claws busy. There are also various toys located on the tower including dangling cat toys and a springy ball toy. The tower measures 19.7x19.7x69.3 inches when put together and is made from durable plywood for longevity. The PARTYSAVING Pet Palace is a place for your cat to hide, duck, play, and rest from a long day of literally doing nothing. It features two perches that your kitty can sit upon rather than using your laundry basket. There are natural sisal ropes that your feline friend can scratch rather than using your furniture or carpets. No more loose threads! These posts can also help kittens with their climbing abilities. The ladder that provides your cats access to one of the condos helps to improve coordination for kittens. 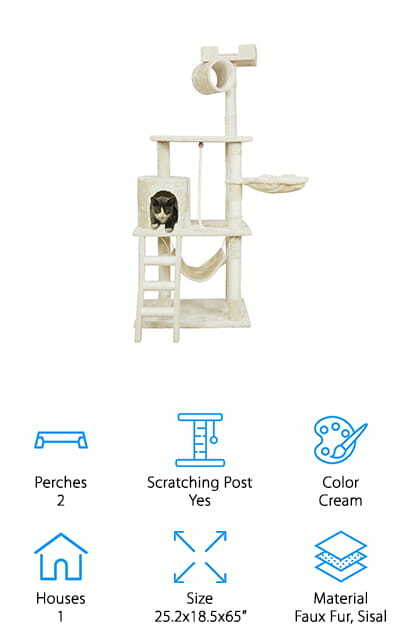 This activity tree is ideal for small and medium cats and kittens. It is not recommended for large cats. Each one of the condos has a large opening for easy entry but still allows your cat to have the privacy they feel they are entitled to. The faux fur lining will help keep them warm and cozy. 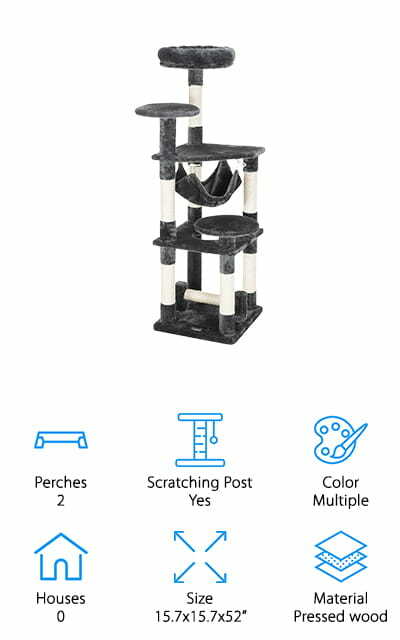 If you are looking for the best cat climbing tower for your feline friend, this one could be it. The Ollieroo Cat Tree Tower features a soft plush surface that offers your kitten two platforms to sleep, rest, and relax. This particular tree tower does not feature a house for them to sleep in, but not all cats need or want one. There are multiple natural sisal scratching posts for your cat to scratch rather than using any other objects in your home. There is a comfy hammock that your cat can sleep in as well as a plush cat bed at the tippy top of the tower where they can watch everything that is going on around them. You can get this tower in a brown or a dark grey color, whichever best suits your color preferences. It measures 15.7x15.7x52” and is made from durable pressed wood and plush faux fur. If you want nothing but the best in luxury for your cat, then check out the SONGMICS Cat Condo. This is exclusive luxury for cats for need a comfy home of their home to play, nap, jump, and climb. There is a roomy house where they can go for their privacy to sleep and a plush basket for luxurious napping with raised edges. This will keep your cat from falling out of it while they are in it. There’s also a little basket where they can sleep as well, keeping their options open. The posts feature sisal rope for your cat to scratch and there’s also a scratching pad at the very bottom of the tower. The whole product is made from CARB-certified natural particle boards and is strengthened with battens at the bottom for maximum stability. This tower is covered by a 30-month warranty and 100% satisfaction is guaranteed. 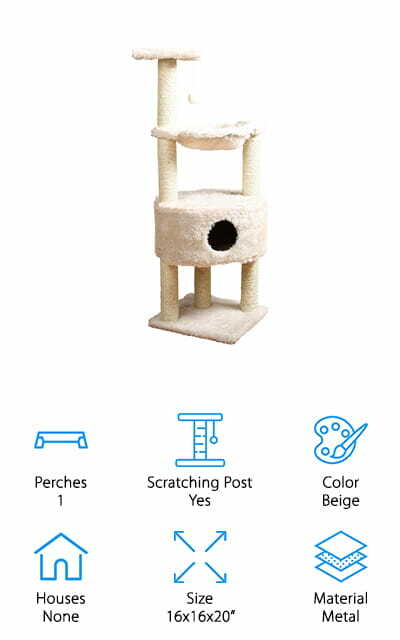 This tower is sure to keep your cat busy and happy. 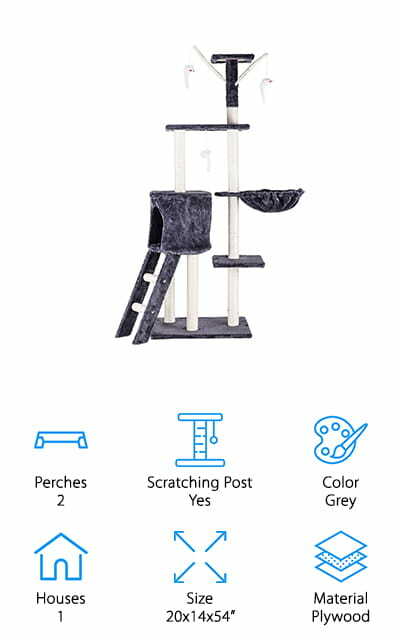 The Hollypet Cat Activity Tree is one of the best cat towers for large cats on this list. This cat tower features one house down at the bottom where your cat can go and sleep or relax without being disturbed because we all know how cats hate to be pestered. The nifty activity tree features two hanging balls for them to bat around and sisal rope for scratching. This can help save your furniture, laundry, and anything else that your precious ball of fur may scratch when they are bored. This activity condo only weighs a mere 7 pounds, so it’s very easy to move from room to room. On top of the house, there is an area where your cat can relax without having to be inside of the house. This is best when placed in the sun so they have a place to sunbathe because we all know how cats love to lay in the sun. This is a 5-level cat tower is made from durable plywood and features tons of space for your small cats to play and sleep. It is coated with fleece and comes with a pair of gloves for easy installation. The heavy-duty pillars are wrapped in natural sisal to provide your cat with an opportunity to scratch without ruining anything personal of yours. These are great dirt-proof scratchers for busy cats. This tower features one private condo with stairs leading to it and a hammock for them to sleep in if they choose not to be private. There are multiple perches that allow them to look around and chill out on as well as some hanging toys for them to bat at. This is a great place for your cat or cats to relax without disturbing your freshly folded laundry or your furniture. Not only that, but these crazy cat towers are stain resistant and only measures 20x14x54”.